Escape the Room: Secret of Dr Gravely’s Retreat is the second entry in their Escape the Room series. We have reviewed that first iteration, Curse of the Stargazer’s Manor, on the blog last year. The TL;DR review of that one was that we loved the idea and the chance to have an escape room experience in our own house, but the level of difficulty may have been a bit easier than we had wanted. However, given the fact that the target audience for this game is the mass-market shoppers at Target. Go back and read the previous review for some interesting back story on the whole puzzle room phenomenon. But, despite the fact that we solved the first one in less than 20 minutes, we were very positive of our experience, and we were looking forward to the next one. We have since played a number of different puzzle room games, and all have had their plusses and minuses. The hard thing about reviewing this sort of game is that it would be a complete disservice to explain the puzzles in the review – the whole magic of the game is in the solving of the puzzles. But, in more general terms, let me explain why we loved this one more than its predecessor. In short, the puzzles are harder. The time limit to start the game is longer, and this is a reflection of the harder level of difficulty in this version. Work with your guests to discover the dark secret of Dr. Gravely’s retreat by finding clues and solving puzzles. But be careful…in the story, the doors have shut and locked behind you. 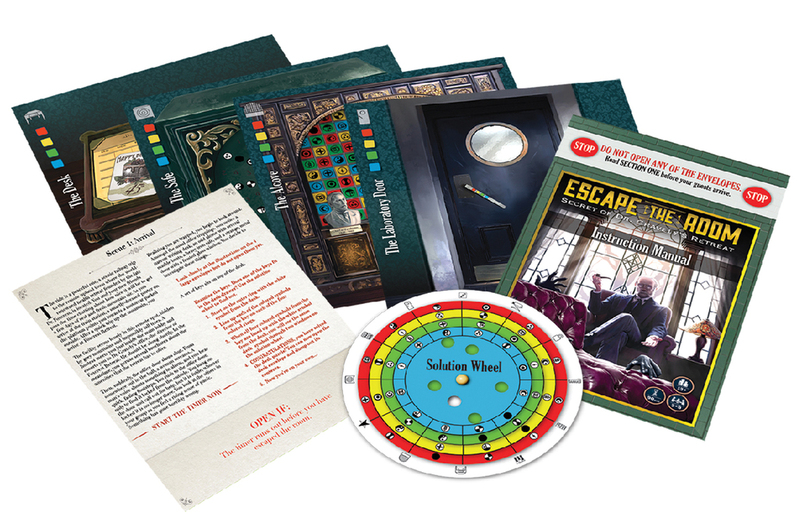 Will you and your guests discover the secret and escape the room before time runs out? The puzzles in the game are contained within four large envelopes. Again, each of these envelopes can be thought of as a chapter in the story. While pieces for multiple puzzles may be found in any particular envelope, you generally have to solve the puzzle(s) in that envelope to be able to move onto the next one. This escape room again uses the rotating puzzle wheel answer thingy to allow the players to self judge their progress thru the game. There is a more varied selection in the types of puzzles offered in Dr Gravely’s Retreat, and that is a nice change from the original. There were also two or three really neat puzzles/props that we were all very impressed by – especially one of the letters. (yes, that’s vague, but you’ll know it when you see it, and now I haven’t spoiled anything!) While the variety and challenge of the puzzles was a distinct improvement, this second version still has the same issue as the first – namely that it is a strictly linear adventure. What I mean by this is that there is generally only one active puzzle at any given time, and the problem for our group with this is that when we played the game with six players, there simply wasn’t enough time for everyone to crowd around a small puzzle or manipulate a prop. So, invariably, two or more of us were just watching the proceedings and chatting while others actively solved things. Sure, it all evened out in the end, but there seemed to always be someone just watching. When I helped another group of three play the game later, it seemed to be the right number as there was something for everyone to be doing at all times. I’m sure that it was easier to write the puzzle room is such a fashion, and it also helps them automate the hint process – which is an awesome help aid for the players. While we did not need the hints while playing the game, I did go back and look at the hint system after the fact. The hints are set up so that you always get the right clue for where you are in the game. The game simply asks you to go down the list of things to do until you get to your current point in the game. You then read the hint for that stage of the game, and that hint will always help you with the currently active puzzle. The hints do come in stages, generally first with a simple vague hint but you can continue to click thru to get more and more detailed clues. We solved the full puzzle hunt with about 25 minutes to spare. The second group of only three players also finished with slightly less time to go. Like the first game, this game is a nice value because you can re-pack it so that others can enjoy it. Sadly, each individual player can probably only play once as you will remember the key parts to the puzzles, but you can definitely help share the game with others as I did – and honestly, it’s almost as much fun watching players struggle with the puzzles as I had doing them myself (or in my case, watching others in my group struggle with the puzzles). 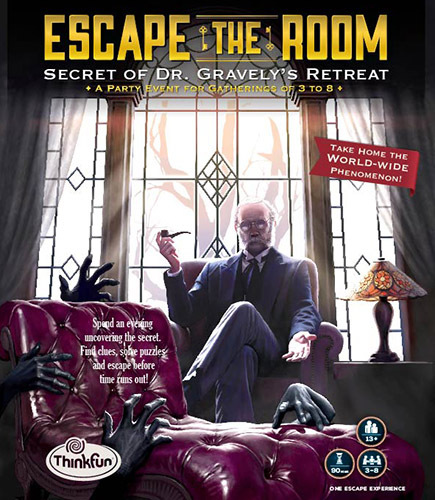 Escape the Room: Secret of Dr Gravely’s Retreat is a much better escape the room game than its predecessor mostly because we found the puzzles a bit more challenging. I certainly can see how ThinkFun wanted the original version of the game to be on the easier side to draw people into the franchise and give them a successful first experience, but I’m also happy to see the harder puzzles in the second game, and I am definitely looking forward to the next game in the series. With an MSRP of $21.99 at Target, this is definitely a fair investment in a evening’s worth of entertainment for you and few friends. The earlier review was this year, not last year. Do I have to proofread everything? My main beef with the original was that you knew what you were suppose to do – In a real escape game you have to find the riddles as well as the clues. The only riddle in the first one was the bonus puzzle. Is this more like the bonus pouzzle or is this again a collection of “normal” puzzles in an order? Format wise, it’s like the first. You will always know what puzzle it is that your doing. It is still extremely linear. Hi Dale Yu, as you play and review escape games board games, have you ever played a “Do It Yourself” escape game at home with friends and families before? I would like to ask this question because I am have a project about a smartphone application in which it can help people implement their DIY escape games at home easier. Hi Dale, thank you for your reply. I guess this is good for people who dont live in centers with escape rooms? Otherwise it seems like a ow-rent substitute for an actual escape room. Ian, sure – I don’t think anyone would really ever consider these games as a full substitute for a real escape room… but, it’s still a fun experience that evokes the same feeling.